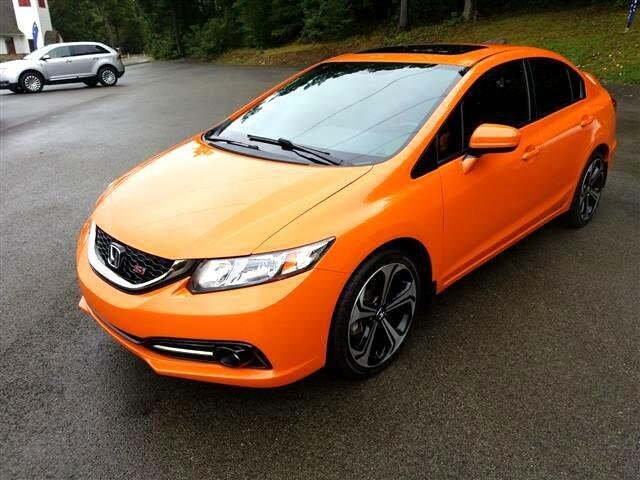 Drivers wanted for this stunning and agile 2014 Honda Civic Sedan Si. Take pleasure in the quick shifting from the Manual transmission paired with this precision tuned Premium Unleaded I-4 engine. With an incredible amount of torque, this vehicle begs for someone to love it! It is well equipped with the following options: Wing Spoiler, Window Grid Antenna, Wheels: 18 Alloy, Wheels w/Machined Accents, VSA Electronic Stability Control (ESC), Variable Intermittent Wipers, Valet Function, Ultra Low Emission Vehicle (ULEV-2), Trunk Rear Cargo Access, and Trip Computer. Drive for days in this lively and fun-loving Honda Civic Sedan. For a hassle-free deal on this must-own Honda Civic Sedan come see us at Wilson Auto Sales, LLC, 5369 National Pike, Confluence, PA 15424. Just minutes away!